The following items are included standard in the purchase of ViperBoard. One ViperBoard circuit board assembly. One USB cable - type A to type B.
SPI master and slave interface. Programmable line rates up to 12Mbit/s. Configurable clock phase, clock polarity and chip select sense. Supports up to 17 master and slave devices. I2C master and slave interface. Programmable line rates up to 6Mbit/s. Configurable output - +3.3V with pull-up, +5V with pull-up or no pull-up. Clock stretching support to allow slow devices to wait-state the I2C bus. 4 analogue inputs read with 8 bit resolution. 16 of these are advanced GPIO bits which can individually be configured as digital IO, PWM, continuous pulsed, single pulsed or interrupt input. Timing of pulse widths, duty cycles and pulse sense are fully programmable. Lower 2 GPIO bits have configurable low pass filters to turn PWM outputs into analogue outputs. High level commands for IIC, SPI and GPIO & Analogue I/F to allow simple development of applications. Extensive low level commands to allow flexible configuration of the interfaces. Windows 2000/XP/Vista, Linux or Mac OS X. C, C++, C#, VB support. The electronics of the ViperBoard is powered through the USB connection. No separate power supply cable is needed. 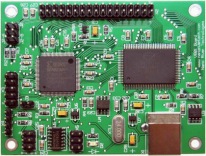 The ViperBoard circuit board assembly is 80mm x 60mm. Nano River Technologies ViperBoard has been designed specifically for test purposes. It is not designed or guaranteed for integration into user’s products. Nano River Technologies takes no responsibility should the user choose to integrate ViperBoard into products. Nano River Technologies takes no responsibility for damage caused through use of the ViperBoard.